As much as I love fall, I don't want to say goodbye to summer. Not just yet anyway. We've had some beautiful warm weather this week and I'm holding onto what's left of it. So today I'm tempting you with a pizza that is brimming with fresh summer flavour. Homemade marinara sauce made with homegrown tomatoes. Double check! 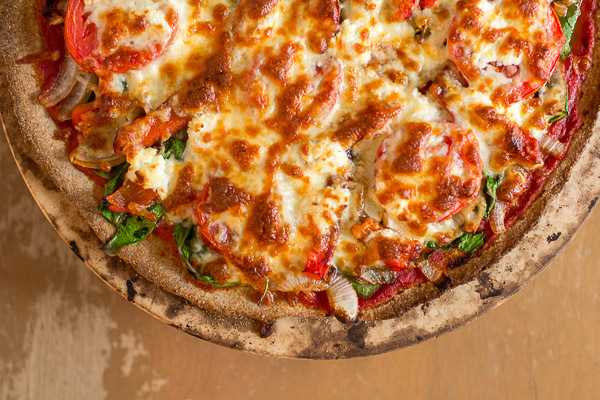 The base of this pizza uses my recipe for 100% whole grain pizza dough, which can be thrown together in a matter of minutes and it only takes 30 minutes to rise. The real star of this meal is the homemade marinara sauce. I admit it takes a bit more work to make, but believe me it's worth it! Especially if you are using your own tomatoes grown from your backyard. 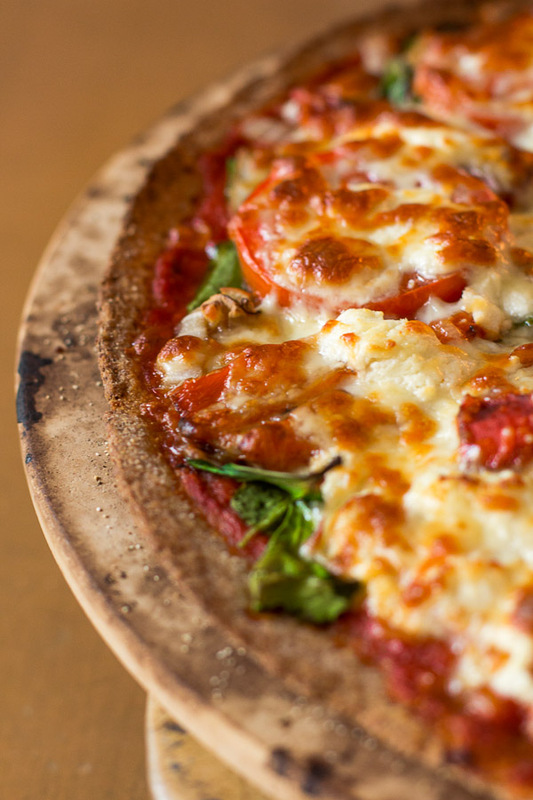 Spread it over your pizza dough, top with more summer fresh tomatoes and mozzarella, and dinner is served. You can change the toppings to your own liking. The sky's the limit. But I personally like this combination of caramelized onions, roasted bell pepper, spinach and sliced tomatoes. Just remember the fresher the better! Place a pizza stone or heavy baking sheet in oven. Preheat oven to 500˚ (keep pizza stone or baking sheet in oven as it preheats). Cut the prepared pizza dough into 2 even pieces. Roll dough out to a 14-inch circle on a lightly floured surface. Carefully remove pizza stone from oven. Evenly sprinkle about 1 tbsp cornmeal over pizza stone; place dough on pizza stone. Spread marinara sauce over dough leaving a 1/2-inch border. Top first with a thin layer of spinach leaves, 1/2 of the roasted peppers and onions. Then sprinkle 1/2 of the goat cheese on top of the veggies. Sprinkle evenly with 1/2 cup of mozzarella. Bake at 500˚ for 12 minutes or until crust and cheese are browned. Top with a few leaves of chopped fresh basil. Cut pizza into 8 slices. Now go make some pizza; fall is just around the corner.